I have a card to share using the Beautiful Day flowers set from Altenew. I stamped one flower on watercolour paper first then embossed it with gold embossing powder and then masked that flower and did the same for the other 2 flowers masking and embossing in between stamping the flowers. I used my Zigs to watercolour the flowers. When that was done I die cut the whole panel using a stitched die. 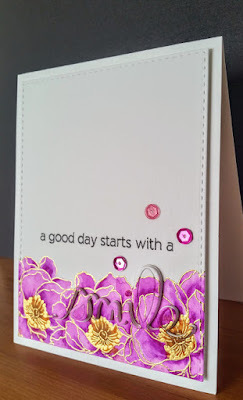 I thought I would just stamp my sentiment and leave it like that but I decided to use the Smile word die to die cut through the flowers and layer the word die in 4 or 5 layers so that it would pop out of the background. Stamped the Altenew sentiment, added some sequins and that's it for my card.